Cllr. 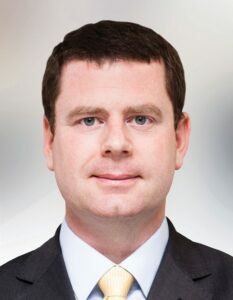 Kieran Binchy has been a Fine Gael Councillor since 2011, and represents the Pembroke South Dock area on Dublin City Council. As a Councillor he represents local residents and the business community with dedication and energy. Amongst his priorities are flood relief works, tackling derelict sites, expanding the Dublin bikes scheme and proper planning and development. Since becoming a Councillor he has ensured the delivery of five consecutive commercial rate reductions, while protecting Council services. He has lived much of his life in Dublin, having moved here from Charleville, Co. Cork. He attended school in Clongowes, and studied Law in Trinity College and International Relations in DCU. He also works as a barrister.